Playing games for 24 hours and raising money to help heal kids! Extra Life is an organization that unites thousands of gamers across the world in a massive 24 hour gaming marathon to help support Children's Miracle Network hospitals. 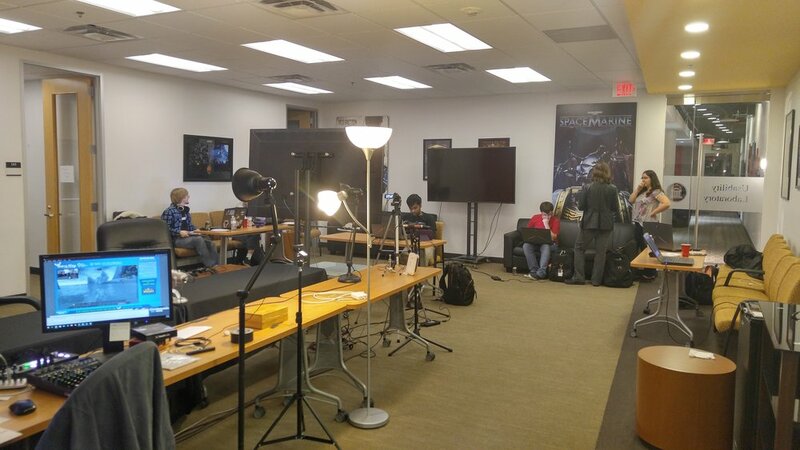 45 SMU Guildhall students, faculty, and staff united to help put on an amazing stream over the course of two days featuring 14 different events and even a 48 hour game jam. The stream raised over $9000 for Children's Health Children's Miracle Network in two days! System Diagram: I designed the system that we used for the stream and drew this diagram in Omnigraffle to document and communicate the design. The system features capacity for two separate staging areas to play games, along with an anchor desk. Master Schedule: I created this schedule in Google Docs to coordinate the timing and efforts of everyone involved in the events over the course of the two days. The schedule doubled as a master contact list and a list of approved events for those who needed it. Twitch Stream: We utilized SMU Guildhall's Twitch account to stream the event, and both 12 hour streams are available for viewing on their page.